With a newborn baby, the one-bedroom loft by Gerrard and Greenwood that Bob Sexton and Norine Williamson were renting in 2011 was suddenly too small for the growing family. Upon meeting someone living in a nearby housing co-operative, the couple decided to apply to live in a unit from Innstead, a Toronto co-op with properties scattered across the east end—about two years later, the couple moved into a more spacious two-bedroom unit in a triplex. “That’s the thing with co-ops… often there can be a long waiting list,” said Sexton. The waiting lists are sometimes lengthy, but the benefits of a co-op, which is an arrangement in which residents pay housing charges rather than rent or a mortgage, can make up for it. “For us, it’s made a huge difference in our lives, really, because it’s allowed us to stay in the Leslieville area and in Toronto and be able to, you know, afford a place and know we can kind of depend on safe and affordable housing,” said Sexton. An affordable housing option like Sexton and Williamson’s will be an option for more people in the area in the coming years as city council approved in early November Innstead’s first new mid-rise housing co-op. The six-storey building will rise where a faded strip mall currently stands and offer 33 units, as well as a small retail space and room for Innstead’s new headquarters. Housing co-ops such as Innstead operate as a single corporation of which all residents are members, and rent-like housing charges go towards the upkeep of the property and, in some cases, a mortgage. “It’s not an equity co-op,” said Paul Connolly, a development consultant for Innstead. “There’s more of an emphasis on stability and affordability,” he explained, noting the absence of a profit motive in Innstead’s model keeps rents at its buildings more stable than they would be on the private market. The co-op’s market units (some other units are subsidised) are 80 to 85 per cent of the average market rate for the Toronto’s census metro area as reported in Canada Mortgage and Housing Corporation’s rental market survey. The average rent for a two-bedroom apartment in the Toronto CMA was $1,404, according to the national housing agency’s survey for October 2017. “But even the average market rent is lower than what people are charging there, right, because the average includes all the units in the entire area that’s being surveyed,” said Connolly. 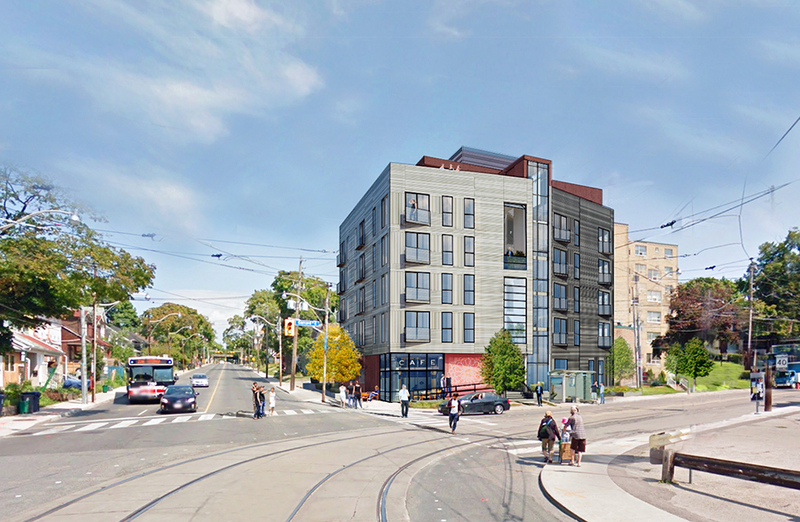 Though Innstead has been around for 40 years, the forthcoming development at 355 and 363 Coxwell Ave. to the north of Gerrard Street East represents a new approach for the co-op. “[Innstead] owns 52 properties in the east end and most of them are like single-family houses or duplexes and they all have stairs and stuff like that, and so they’re not very accessible right now,” said Connolly. The mid-rise project, however, will allow Innstead to offer housing options in a building with an elevator and accessible washrooms. As existing co-op members age, they could move into the new, more accessible building to meet their needs, Connolly suggested. “But we didn’t see it as exclusively a seniors building, we wanted to have some small units as well so that if there are younger people leaving the family home [they] would have an affordable option in the neighbourhood,” he said. Ward 32 Counc. Mary-Margaret McMahon recently voiced her support for co-ops in general and this project specifically. “It’s a great model. We want to work towards more of that kind of co-operative housing,” she said. But there are barriers to forming new co-ops in Toronto. Connolly suggested soaring property values in the city make it difficult for co-ups to establish themselves. “Land’s getting very expensive in this part of town,” said Connolly. Innstead purchased the Coxwell-fronting land for just over $2 million about two years ago and anticipates construction will cost roughly $8 million. The relative affordability of Toronto’s east end in the past has allowed Innstead to acquire its portfolio of properties, something that it has leveraged in order to qualify for financing to support its inaugural new-construction development. “If you have a big building and it’s, you know, it’s still not all paid off, then you can’t use it as collateral for a new development,” Connolly explained. Innstead expects to receive a demolition permit from the city in February, and about a year from now the co-op plans to start accepting applications for units in the new building. Connolly said a list of all co-ops currently accepting applications can be found on the The Co-operative Housing Federation of Toronto’s website at www.co-ophousingtoronto.coop. I would love to get my family into a stable and affordable housing situation here in our Leslieville neighbourhood. I am on all open wait lists for co-ops in Toronto, but seems near impossible to get through the never ending wait lists or co-ops that even offer more than 2 bedrooms. (My family needs 3). Maybe some luck with this new project, which is literally up the street from my extremely expensive, market rate rental. Although looks unlikely that it’ll offer 3 bedrooms.